I started off with getting a cocktail prior to the food arriving, ordering the Next of Gin. Next of Gin featured Brokers gin as its base spirit and included cucumber, lime, bell pepper, and lavender. I found this cocktail to be very vegetably. 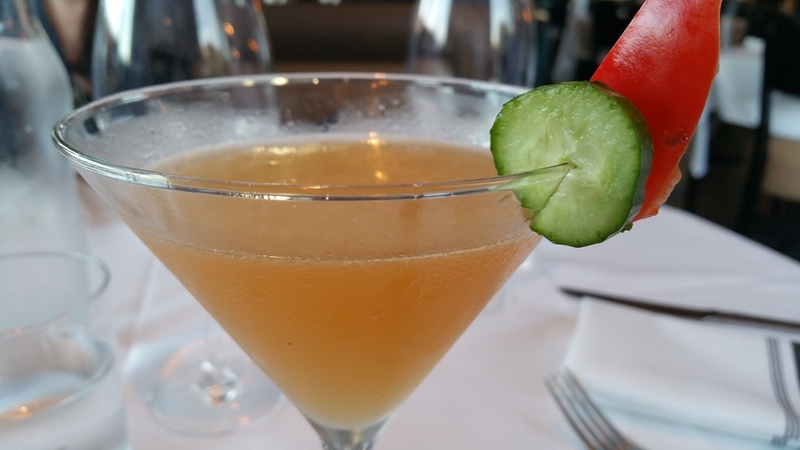 The cucumber and lime are not uncommon accompaniments to gin. However, the bell pepper is interesting, since it’s actually not really that totally different from cucumber, although it does provide a slight pepperyness. Later on in the meal, I ordered another cocktail, this time the Old Fall Fashioned (which is amusing, since it was springtime). 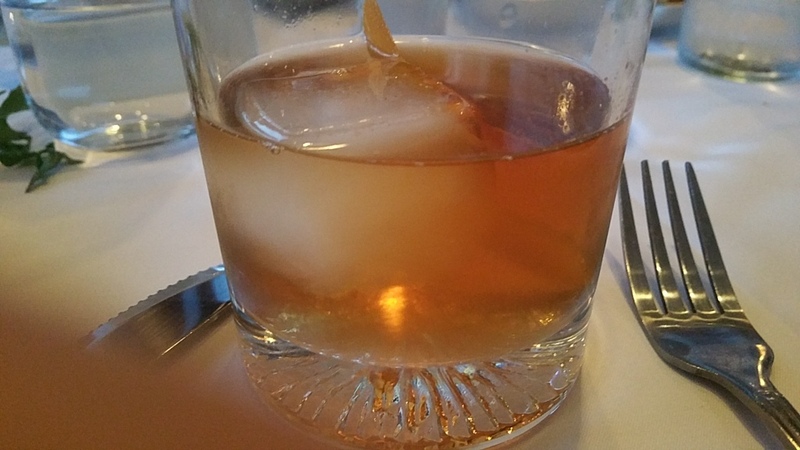 The Old Fall Fashioned contained Old Overholt Rye as its base spirit and included persimmon, maple, bitters, and cinnamon stick. Wow! This cocktail was so lovely! It was sweet with a soft landing afforded by the sweet things within it. Oh my! I am definitely ordering this cocktail again when I return again. 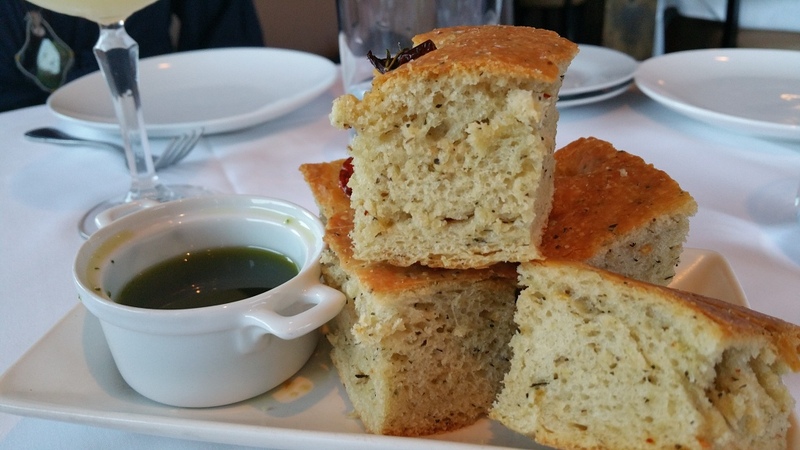 Moving on now to the food, the bread served had some herbs within it. The bread was served with aioli sauce, for which I didn’t care, but the bread was good on its own, which is good. 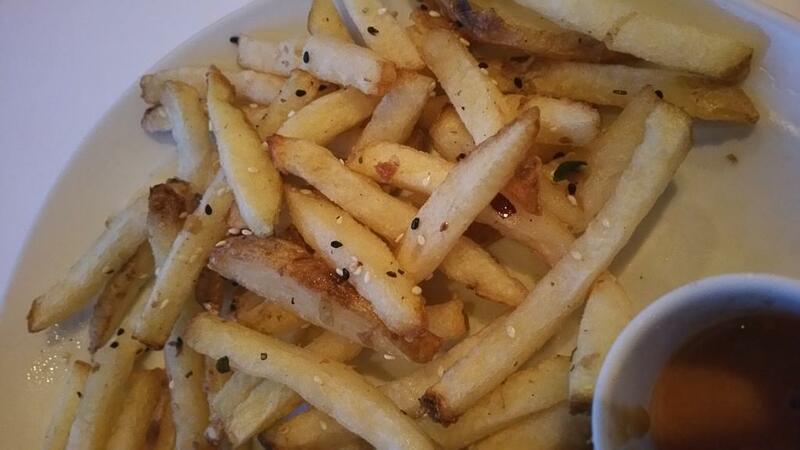 The french fries had sesame seeds with them and were quite yummy. A few other appetizers I had were also tasty. 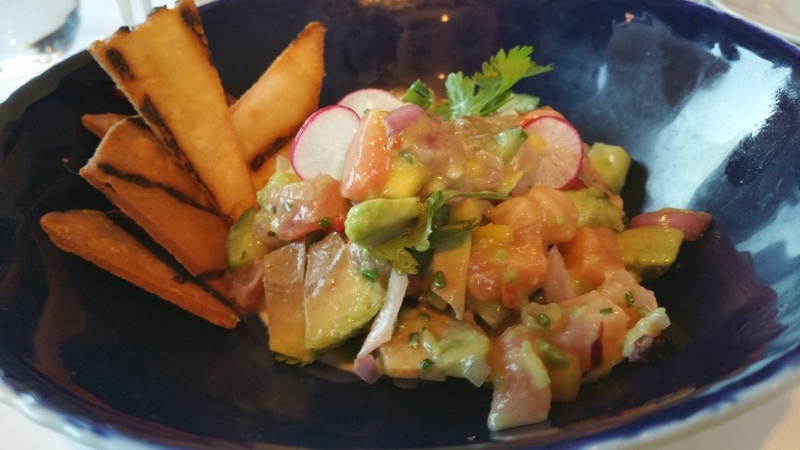 The Salmon and Tuna Ceviche, of which I only had a bite, had nice soft textures of fish, avocado and others on crunchy chips. It was noticeably lemony. 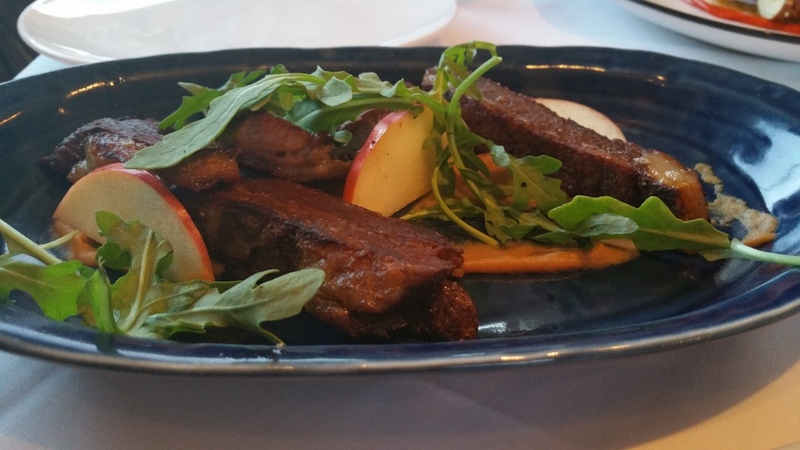 I also only had a taste of the Bacon Lamb and Apple Butter, which was so incredibly soft and fantastically yummy. 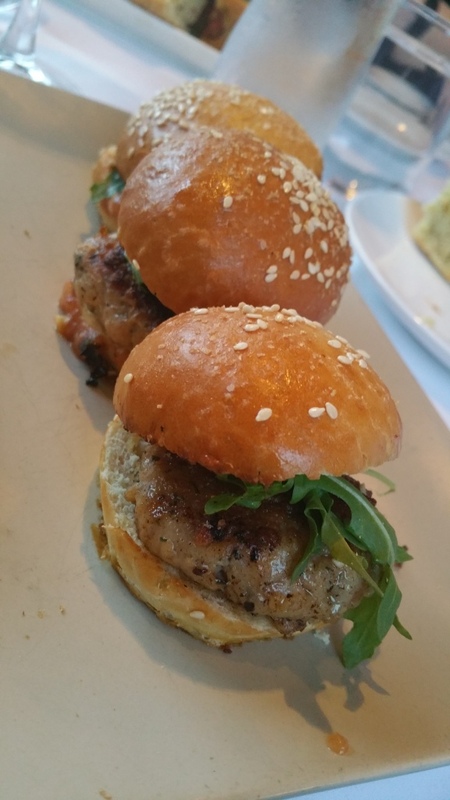 And the lamb sliders had nicely spiced meat. 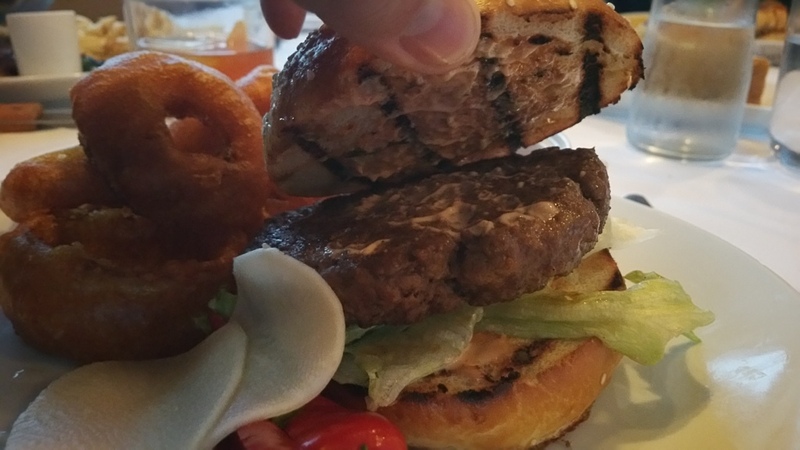 For my entrée, I had the Shalom Burger II, which was good – a burger with pickles, iceberg lettuce, and a special sauce. It was accompanied by onion rings, which were incredible! Being light, airy and crunchy, one could tell that these onion rings were freshly made and delectably so. Not that we had much room left for dessert, but we had some, anyway (we were there to celebrate a birthday, after all). 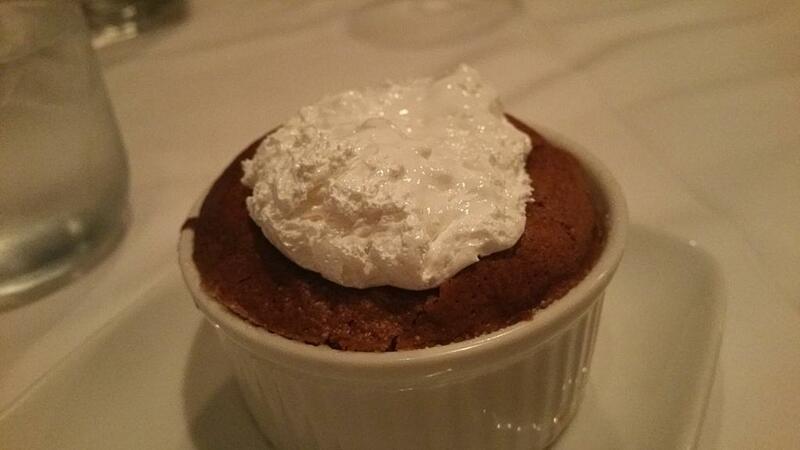 The Chocolate Soufflé was like a pudding and incredibly delicious. It was also served with marshmellow, although it was yummy on its own. We also had the Fudge Brownie, which was so tremendously yummy. 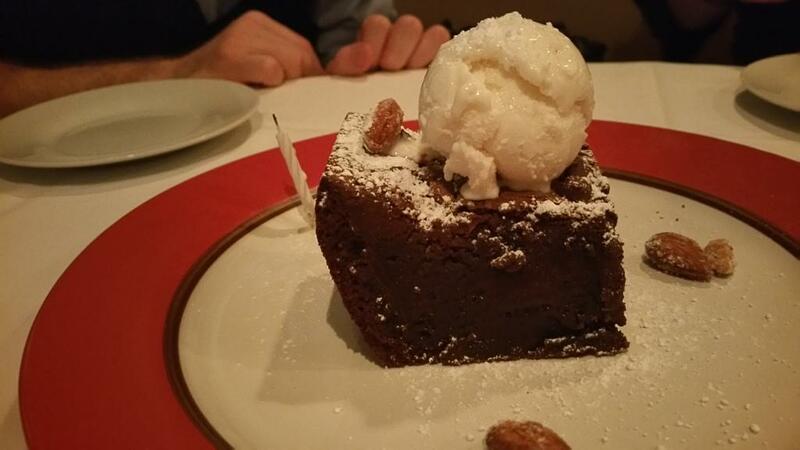 This Fudge Brownie was not typical for a brownie, but it was atypical in a good way. 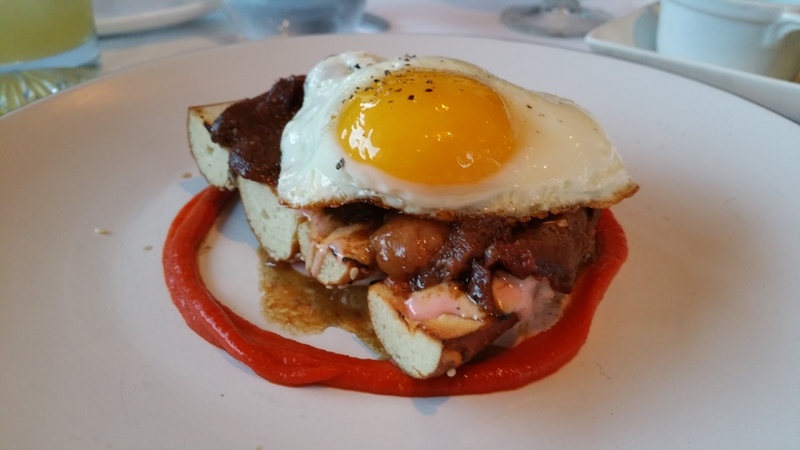 It was solid, but some softness and incredibly delectable. We enjoyed a quieter night at the restaurant, which was good for us, as we received good service. Something I hadn’t noticed on my first visit was their fun, eclectic, and chill music, which included Digable Planets’ “Cool Like That” and A Tribe Called Quest’s “Electric Relaxation”, and other such 90s music, although it also had music from the past decade, as well. 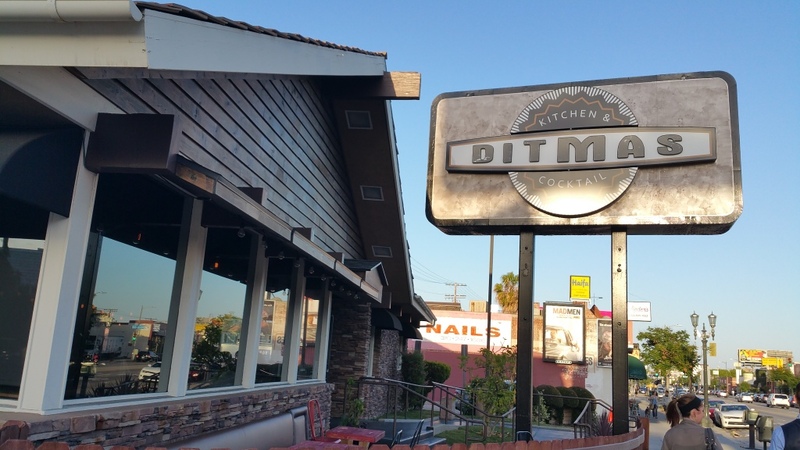 It was yet again another delicious and enjoyable visit to Ditmas. * A big thank you goes out to my father-in-law for taking us out to dinner there!